I have recently came across a fantastic map project by Geolic.com, mapping the entire world as it pertains to the various national football teams and the manufacturers that supply their kits. So let's take a look at the world of football and which companies dominate the market and what other interesting things we can find within this map. On a global scale and looking at the complete world map above one thing is quite obvious: Nike and Adidas are still the world leaders in football kit manufacturing which is probably not surprising to anyone. But I noticed one interesting fact which I never realized before. Nike are the current suppliers for 6 of the ten most populated countries in the world including every nation from the top 5 on that list, putting its brand in the world's largest markets such as China, India, USA, Indonesia, Brazil and Nigeria. That said, Adidas seems to dominate the larger total amount of markets including Russia and Japan which are also in the top 10 most populated nations in the world. Looking at the smaller companies I have noticed two interesting things: Puma seems to have really lost its market share in the national team sponsorship departments and Spanish company Joma (green) is starting to appear in quite a few places. Now let's take a look at the map region by region. 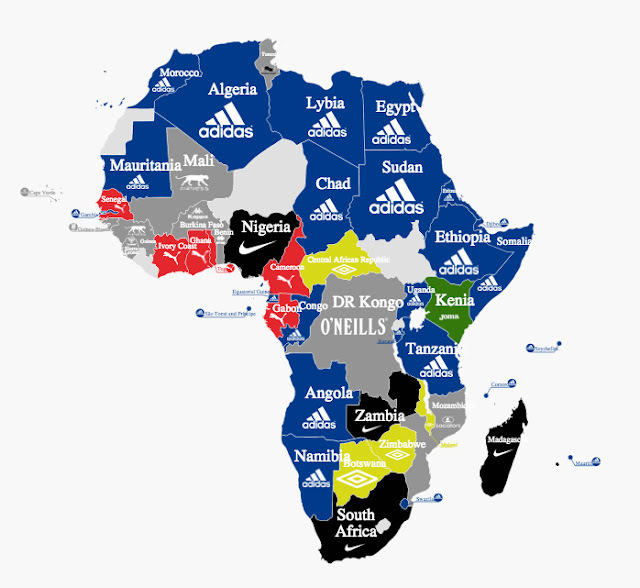 One thing is apparent in Africa right away; the continent is dominated by Adidas and Puma has really lost its grip on the CAF, which used to be the manufacturer's strongest continent for some time. The Adidas "blue" spreads all across the norther part of the continent with strong footballing nations such as Morocco, Algeria and Egypt all signed on with the German manufacturer. Nike and Umbro both supply 4 African nations with kits, a comparison that seems a bit odd given Umbro's inferior share in the market, but it's clear that the two are nowhere near one another as Nike supplies kits for the number 1 and number 5 most populated nations on the continent in Nigeria and South Africa. One odd thing that caught my eye was the partnership of DR Congo with Irish manufacturer O'neills which is known for its support of the Irish GAA but not so much for football. Apparently, the nation's football liaison officer has been living in Dublin for the last 15 years and is the connection between the two working together. While there are quite a few smaller companies such as Uhlsport for Iran and Lotto for Syria and Myanmar, Nike is without a doubt the kit leaders on the continent. 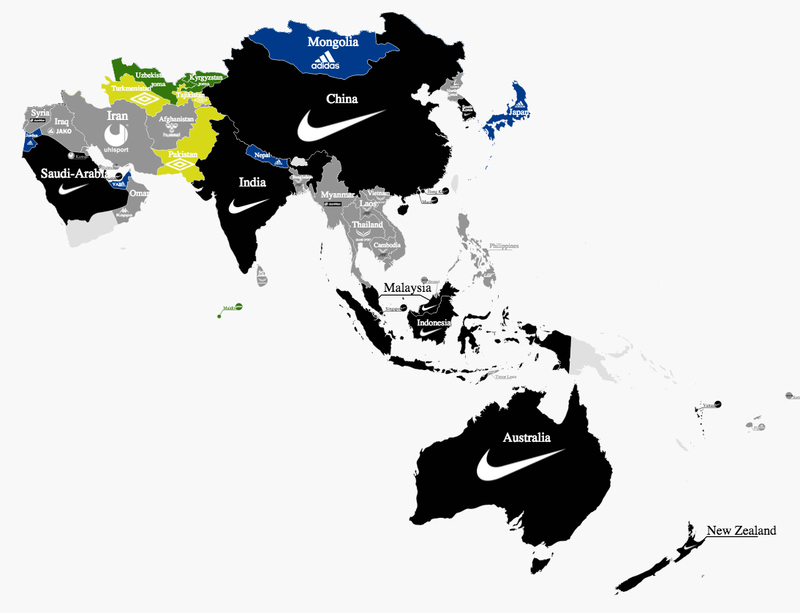 With Saudi Arabia, Australia, New Zealand, Indonesia, China and India all signed on, Nike has their brand in the not only the largest markets in the AFC but worldwide. One company however caught my attention as I didn't really know much about the brand. Thai sportswear company Grand Sport Group is starting to show up in a few nations, most notably its own national team Vietnam, Sri Lanka and of course North Korea. Apparently the copmany has existed since 1961. 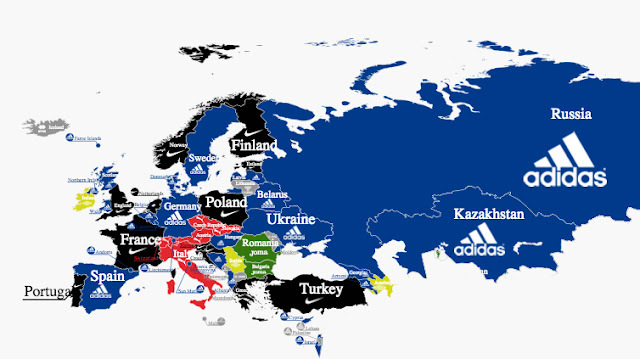 Not surprisingly perhaps the European market is dominated by Adidas, with Nike claiming a few large markets as well. But while most of us are familiar with the large European footballing nations and their sponsored kit manufacturers, I wanted to take a look at the smaller companies that are able to compete in the UEFA region. Puma's share of Europe looks like a last attempt at survival in a game of Risk. All of the countries they supply uniforms to are bordering one another and it looks like Nike and Adidas are really squeezing. Nonetheless, Czech Republic, Austria and Italy (among a few others) are pretty decent national teams to be associated with. We've already seen their green on the Asian map with Uzbekistan and Kyrgistan and in Africa with Kenya, and now Joma has also put their stamp on Europe as the kit supplier for neighboring nations Romania and Bulgaria. Big steps for a Spanish company that has been in the club level for a long time but has had trouble getting into the national team market. Umbro seems like giants in the CONCACAF market but that's only because Canada is so large. In reality, the UK company is struggling on the national team level market share and their contract with Canada and Guatemala who's combined population is 52 million people (rounded up) are trumped by both of Nike's and Adidas' markets. 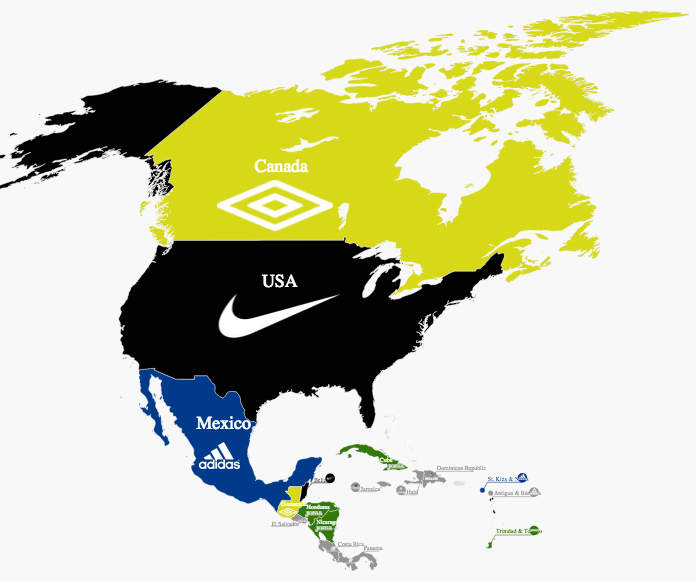 USA and Mexico individually have larger populations than Umbro's markets as Adidas and Nike comfortably control the kit manufacturing in the region. Despite the "big two" dominating CONCACAF, again we notice more of Joma's green on the map as the Spanish manufacturer provides the kits for various nations both in the Caribbean islands and on mainland Central America. Last but not least, the South American region presents almost the same situation as the CONCACAF region as Nike and Adidas are absolutely dominating the continent. 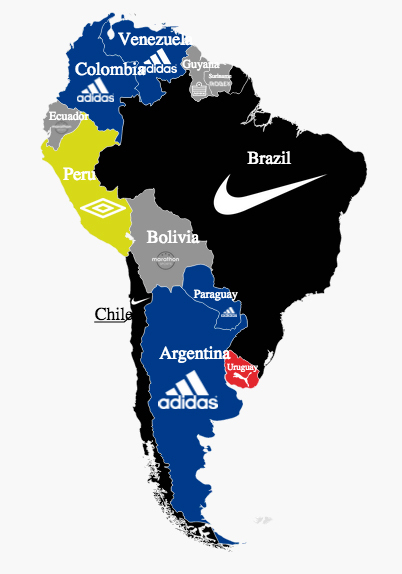 As has been the case for many years, Adidas and Nike control the two most popular markets in CONMEBOL as the manufacturers of Argentina and Brazil. Puma seems lost once more with Uruguay as its only nation, when even small-time Ecuadorian company Marathon was able to sign on both their own national team and that of Bolivia. Is Signing Drogba a Good Thing or a Bad Thing? James McClean, How Far is Too Far? Who the Heck is Steven Gerrard?